[AMSTERDAM - PHARMACOPOEIA]. [TULP, Nicolaes]. Pharmacopoea Amstelredamensis, senatus auctoritate munita & recognita. Editio quinta. London, [s.n. ], 1662. 2 works in 1 volume. 16mo. Contemporary vellum, new endpapers. 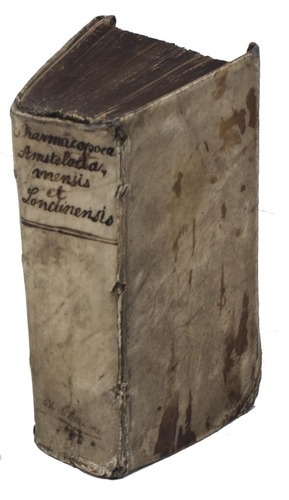 Ad 1: Rare fifth edition of the first official pharmacopoeia of Amsterdam, first published in 1636, and compiled anonymously by Nicolaes Tulp (1593-1674). It was initiated by the city of Amsterdam, to serve as an official legal standard for the correct preparation of numerous medicines. The book contains recipes for nearly 200 medicines. Several cities in the southern Low Countries and Germany, and even London, had produced pharmacopoeias before any Dutch city and Tulp based his on those published in Augsburg, Cologne and London, primarily on the 1622 edition of the Pharmacopoea Augustana (providing about 85% of the content). Ad 2: Eighth(?) edition of the official pharmacopoeia of London, first published in 1618 and compiled by the College of Physicians of London. It contains over a 1000 medicines, including syrups, waters, pills, powders, etc. 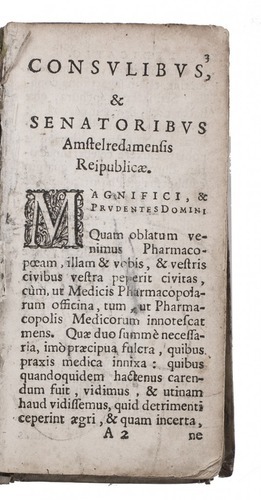 The London pharmacopoeias used many Greek and Arabic names for their medicines and ingredients, which were mostly dropped in the edition of 1677. Many editions appeared upto the 18th century. With a small owner's inscription on title-page of the first work. Slightly browned with some occasional small spots, leaf I1 of ad 1 torn, affecting part of the text. Bindings stained and bookblock detached from binding at front hinge. Overall a fair copy. Ad1: STCN ( 1 copy); WorldCat (4 other copies); cf. Daems & Vanderwiele, pp.47-48; ad 2: ESTC (9 copies); Krivatsky 8929.